The Tiny Owl Knits pattern, Beekeeper’s Quilt, has been sweeping the knitting world recently. A quilt made up of individually knit hexagons, or hexipuffs, this is a great project for using up leftover bits of lightweight yarn and satisfies that urge for instant gratification knitting. The pattern is reportedly quite addictive, and has inspired mini-skein swaps and yarn trading around the globe. The hexipuffs have landed at Stash, and we’re churning them out for a good cause: Juvenile Diabetes Research Foundation. Local knitters are clicking away in an attempt to knit up 600 hexipuffs by March 31, 2012. Interested? The yarn has been donated by Hayes + Associates, and is available to pickup at Stash. The colors are a cheerful palette of turquoise, yellow, red, and variegated Shibui Sock yarn. Stop by the shop to see how you can help. Knitting for a good cause with free yarn: it doesn’t get much better than this! Last night some participants of the first Stash Knit Along joined together at Stitch Night and cast on. There were a few Paper Moon sock knitters and a couple of Hado Slouch hat knitters, as well as plenty of other non-kal-related projects on the needles. It’s so fun to see what yarn everyone chose! It warms this knitter’s heart to see knitters helping one another get started, make color decisions, and pulling in unsuspecting knitters. That’s what a knit along is all about: support, encouragement, inspiration, and sharing knowledge. And fun, lots of fun. a) post a photo of their finished project on the KAL thread in the Ravelry group or to the Stash Facebook page. b) bring it in to Stitch Night to show it off! This means that you can participate from afar, so what are you waiting for? Multiple entries for multiple finished objects. Entries will be chosen at random and winners announced on March 1st, 2012. Prizes will include sock yarn, books, patterns, and more TBA. Cast on! Knit down my stash of sock yarn. Buy no new yarn except for gifts knitting. Here at Stash we’ve conjured up a way to have your stash and knit it too. Want to knit down your stash this winter? Looking for a reason to buy that skein of sock yarn you’ve been coveting at the shop? Want to try a new technique with the safety net of a few talented knitters? 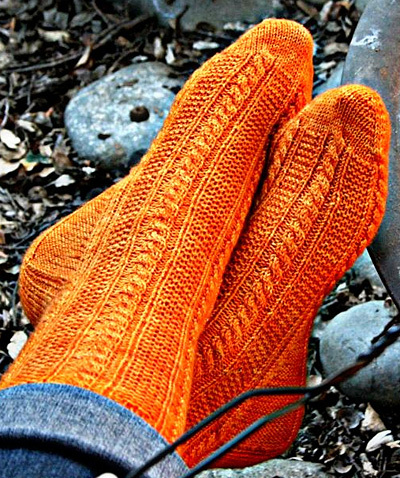 Option 1: Knit the Paper Moon Socks by AnneLena Mattison, a free toe-up pattern from Knitty. Use stash yarn or buy something new! Sweet Georgia Cashluxe Fine would be a delicious option. Option 2: Knit the Hado Slouch Hat, a pay pattern from Olga Buraya-Kefelian. You can use up leftovers for the stripes or buy one of our kits made up of Shibui Sock. Either option provides an opportunity to knit a juicy, fun pattern along with your fellow Stash-ers. I plan on tackling toe-up socks with this knit along, something new to me. We will cast on January 18th, so think about what you’d like to knit. There is already a Ravelry thread where we can share our projects, questions, and encouragement, as well as Stitch Night on Wednesdays.